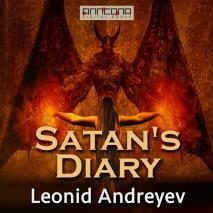 Satan's Diary is a novel by Russian author Leonid Nikolayevich Andreyev, an acclaimed Russian playwright and writer of short fiction, who was noted for the darkness in his work. Satan's Diary, Andreyev's last work, was completed by the great Russian a few days before he died in Finland, in September, 1919. But a few years ago the most popular and successful of Russian writers, Andreyev died almost penniless, a sad, tragic figure, disillusioned, broken-hearted over the tragedy of Russia. In Satan's Diary, Andreyev summoned up his boundless disillusionment in an absorbing satire on human life. Fearlessly and mercilessly he hurled the falsehoods and hypocrisies in the face of life. He portrayed Satan coming to this earth to amuse himself and play. Having assumed the form of an American multi-millionaire, Satan set out on a tour through Europe in quest of amusement and adventure. Before him passed various forms of spurious virtues, hypocrisies, the ruthless cruelty of man and the often deceptive innocence of woman. Within a short time, Satan finds himself outwitted, deceived, relieved of his millions, mocked, humiliated, beaten by man in his own devilish devices. Satan's Diary was translated by Herman Bernstein. Total Running Time (TRT): 8 hours, 49 min. Reading by Carolin Kaiser.